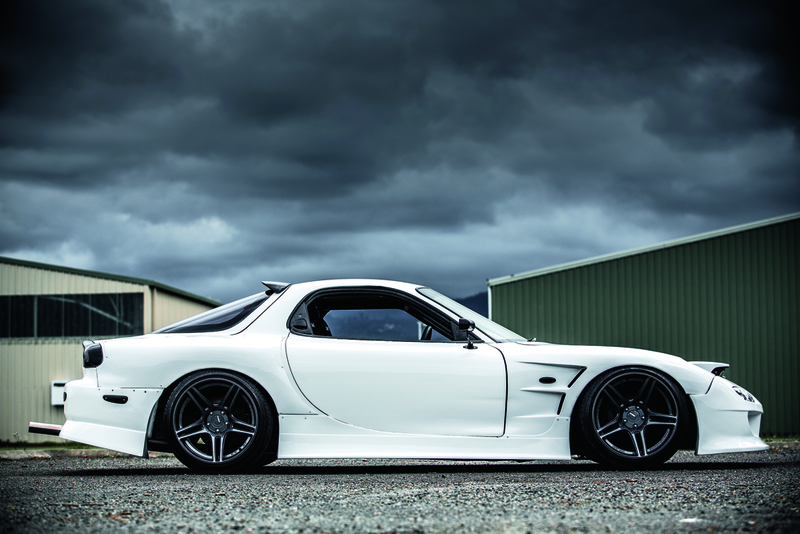 Nathan Champman’s SR20DET-Powered Mazda RX-7 is bound to ruffle a few feathers. teenager, but until recently he never once thought he’d be able take both those loves and mash them into one beautiful machine. With his newly acquired sense of maturity, Nathan left his Mazda days in the past (or so he thought), and decided to take his love of drifting to the track where it rightfully belongs, acquiring himself an S13 Nissan Silvia to use in the local drift series, Drift South. He tells us: “I bought the S13 not going. It was completely original at the time, and I built that up to daily drive and compete in on the weekends.” After a few successful events, the Silvia’s SR20DET unexpectedly melted a piston, spelling the end of Nathan’s attack on his local track, Ruapuna’s Mike Pero Motorsport Park in Christchurch. Instead of letting the meltdown keep him from the track, Nathan saw it as an opportunity to do things right, if a little differently, when his old RX-7 shell came back up for sale. The RX-7 had received a little love in the time it had spent apart from Nathan, though much of it would eventually be redone: “Scott had caged the car thanks to Paul Tomlin at Surfab, and had begun setting the engine bay up to take a Toyota 1JZ-GTE straight six-cylinder. I think he probably realized just how much work was involved and decided he couldn’t commit, so I got it back.” The Mazda returned to Nathan’s possession complete with the custom widebody kit, though a lot of time has since been spent reworking it to get everything fitting right. Now it was back in the home garage, and between Nathan and his good friend and fabrication guru Ryan Scott of Corona Customs, work began on fitting the small, lightweight four-cylinder, now running forged internals, into an engine bay it was never meant to go near. Though it certainly is different, it’s important to remember that even if this RX-7 had a conventional rotary power plant, it would still be a car worth noticing. Great build quality, nice tidy finishing touches, and super-aggressive looks make this machine one of the best and most interesting southern rides to hit the tracks and streets of the South Island this summer. We’re certainly looking forward to seeing, and hearing, this unique machine come race day!